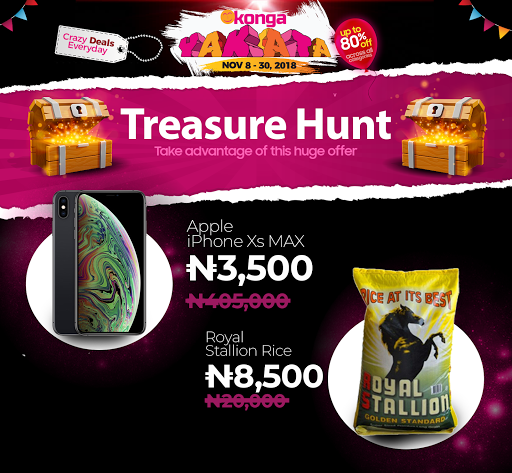 KONGA YAKATA unveils its TREASURE HUNT PROMO coming live on Friday, the 23rd of November 2018 beginning at exactly 9am. The Hunt will feature highly-sought-after discounted items that will be hidden in different places on the website. These items come with discounts as low as 80% off and are open to the general public but restricted to the fastest fingers only. Download the ‘KONGA’ Mobile app & make the Konga Website your Friend as loads of deals will go live! The Item will be hidden in an unrelated category on the website. For instance, a gadget may be hidden in the shoe section on the website. Once you find the item, Order it FAST! The 2018 KONGA YAKATA TREASURE HUNT is the most anticipated event of the YAKATA season, This could be your opportunity to get that item you’ve always dreamt of at a much less price than your budget. You cannot afford to miss out on the thrill and excitement tomorrow.